Joined the Yorkshire Regiment 9 December 1914. Served with the 6th Battalion. Wounded at Gallipoli 21 August 1915. Wounded in Battle of the Somme, 27 September 1916. Returned to serve at the Depot, Richmond. Discharged due to health on 29 May 1918. 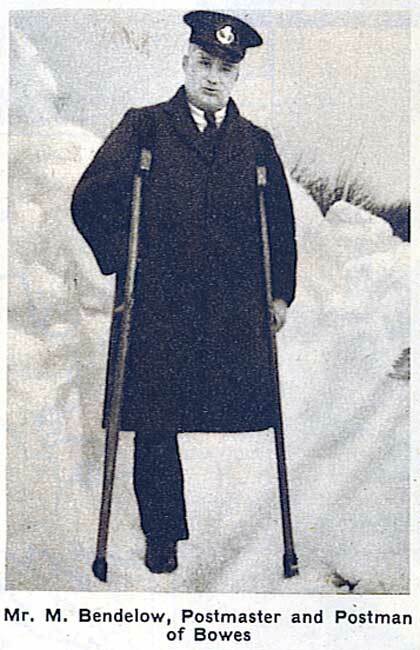 Private Bendelow lost his left leg above the knee, and was also wounded in his left arm. However, this did not stop him leading a very active life, and he was Postmaster at Bowes, near Barnard Castle, for nearly 40 years. The information of Private Bendelow has been provided by David Charlesworth (<dave.charlesworth@btinternet.com>). The Post Office Shop Blog has included an article on Matt Bendelow as part of the Post Office's incentive to remember the extraordinary lives of Post Office employees in the First World War.